The European Space Agency's ESA Faint Object Camera utilizing the corrective optics provided by NASA's COSTAR (Corrective Optics Space Telescope Axial Replacement), has given astronomers their best look yet at a rapidly ballooning bubble of gas blasted off a star. 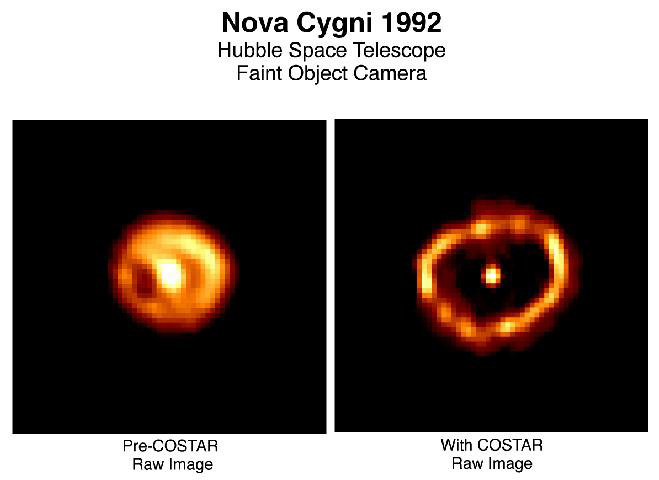 The shell surrounds Nova Cygni 1992, which erupted on February 19, 1992. A nova is a thermonuclear explosion that occurs on the surface of a white dwarf star in a double star system.